The report “Pea Protein Market by Type (Isolates, Concentrates, Textured), Application (Meat extenders and analogs, Snacks & bakery products, Nutritional supplements, Beverages), Textured Pea Protein by Form (Dry, Wet), & by Region - Global Trends & Forecast to 2020”, defines and segments the pea protein market on the basis of type, application, form, and region, with analysis and projections of the market size of each of these segments in terms of value (USD thousand) and volume (tons). It also identifies the driving and restraining factors for the pea protein market with analysis of the trends and opportunities. Pea protein is extracted from yellow peas through the extrusion process. It can be extracted in three types such as pea protein isolates, pea protein concentrate, and textured pea protein. Pea isolates are a more refined version of pea concentrates while textured pea protein contains higher amount of protein as compared to concentrates and isolates. Pea protein is used in a wide range of applications such as snacks, beverages, nutritional supplements, and meat alternatives & extenders. Pea protein products can replace a significant percentage of other proteins in many food products without impacting the color, taste, or texture of the product, and in many cases can offer cost savings. Pea proteins also offer health benefits such as weight management, maintain healthy muscle, improve blood circulation and calcium absorption, boost metabolism, and regulate blood sugar among others. Thus, pea proteins have emerged as an alternative and/or as a complement to other protein and non-protein ingredients. The rising vegan/vegetarian population and high nutritional profile of pea protein are the key drivers of the pea protein market. This market is characterized by the stringent regulations put by the regulatory bodies on the inspection of the food products and guidelines for food processing. The leading companies, research institutes, and organizations are continuously involved in R&D to develop innovative pea protein products that can be easily incorporated in a wide range of applications. These innovative pea protein products are specially designed as per the requirements of food & beverage products and nutritional supplements. Key market players adopted new product launches, expansions, and partnerships, agreements & collaborations as their preferred strategies to sustain in the market. 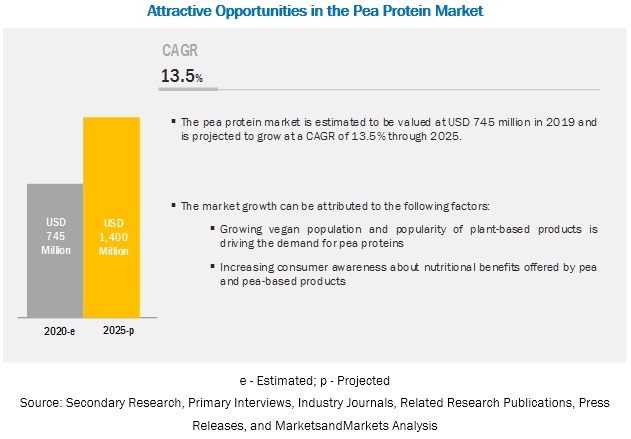 The market for pea protein is projected to reach USD 34.8 Million by 2020 at a CAGR of 8.80% from 2015 to 2020 in terms of value. North America is estimated to be the largest market for pea protein both in terms of value and volume in 2015. The Asia-Pacific region is projected to be the fastest-growing market with a CAGR of 9.35%, in terms of value, and 9.57% in terms of volume during the forecast period. This growth is mainly driven by the increasing awareness among food & beverage manufacturers and growing consumer demand for pea proteins about their high nutritional profile, particularly in countries such as China, Japan, and Australia. This report includes a study of marketing and development strategies, along with the product portfolio of leading companies. It includes the profiles of leading companies such as Roquette Frères (France), Burcon Nutrascience Corporation (Canada), Cosucra Groupe Warcoing (Belgium), Nutri-Pea Limited (Canada), and Sotexpro (France). Other key companies that are active in the market include Axiom Foods, Inc. (U.S.), Farbest Brands (U.S.), Shandong Jianyuan Foods Co., Ltd. (China), Yan Tai Shuang Ta Food Co., Ltd. (China), and The Scoular Company (U.S.).